Since its initial release in 2016, Apple Search Ads has become a priceless tool to improve their apps’ visibility. Without a doubt, it has helped boost conversion rates of average mobile users up to 50 percent. Earlier this year Creative Sets hit the market. Being little additions to its Search Ads Advanced platform, Creative Sets aim to improve ad performance. The explosive growth of mobile apps has created an ultra-competitive marketplace of 1,4 million apps on both the App Store and Google Play. Thus, Apple’s platform earned more than double the revenue of Google’s with fewer than half as many downloads. As a result, the challenging battle for user’s attention is heating up. 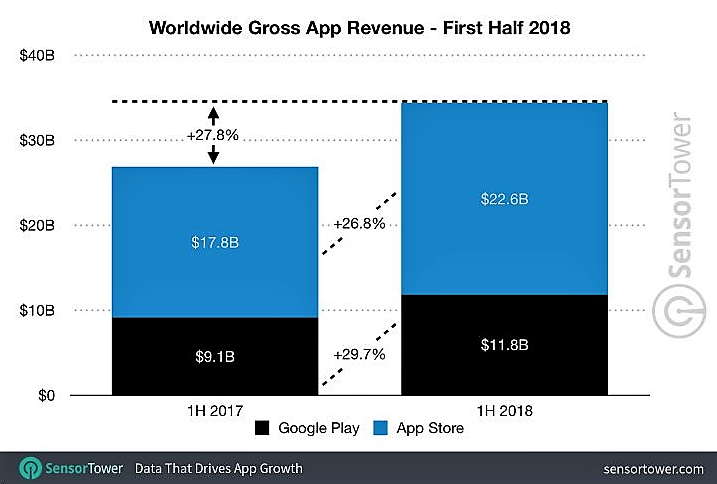 With near 66 percent of mobile app revenue generated by Apple’s App Store last quarter, the global app revenue reached $34 billion in the first half of 2018. So, if you are on the hunt for mobile users, make sure that your marketing efforts didn’t go waste. With the initial purpose to help marketers to get noticed, Creative Sets include additional creative images to add more variations aligned to specific ad campaigns. However, the beauty of these variations can give developers more opportunities and elegance in achieving it with the few options. In the example above, it’s easy to see that different creative is displayed when different keywords are used. It makes the ad even more relevant to a user by showing different dynamic combinations of your selected creative when triggered by different keyword groups. 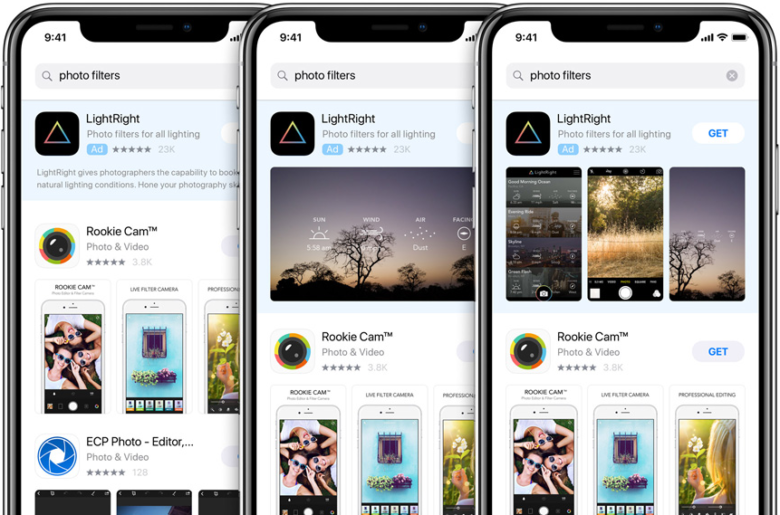 Long awaited by developers, Creative Sets allow you to have up to 10 Creative Sets per ad group in addition to the current image and text ads that Search Ads automatically creates for you. Having more creatives and being able to tie them to relevant searches provides a way to better target campaigns. In case of lack, delete old creative sets. 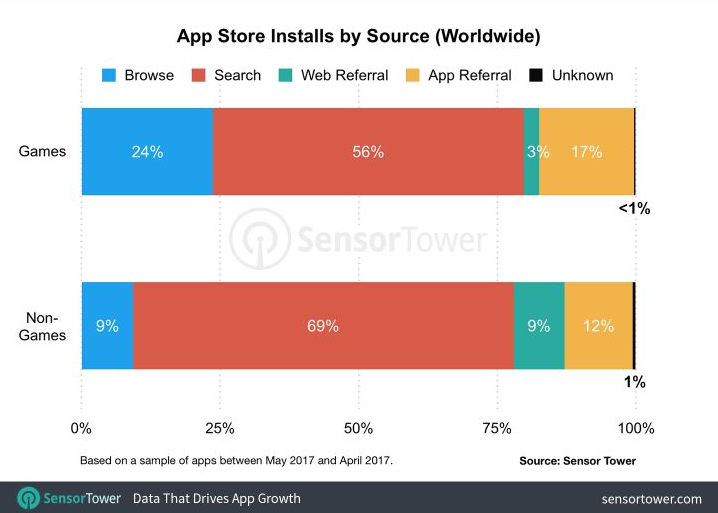 Typically, by generating a volume of installs from both organic and paid sources is key to improve your app discoverability. With an unwritten rule that every paid install drives three organic ones, it makes sense to make the best use of Creative Sets to boost your organic rankings. Learn how to succeed in affiliate marketing through email. Here are a few professional tips from the Profitner team. The opportunity to grow your mobile app user acquisition rate through Apple Search Ads is now available in countries that do not have a dedicated App Store default to the U.S. App Store. Thus, investing in Apple Search Ads Creative Sets seems like a no-brainer if you are on the lookout for more impressive results. Although search is a king, organic store browsing is the second highest discovery method for users. According to a recent study, 65 percent of overall App Store downloads came from search. To be more specific, 56 percent amount for game downloads compared to 69 percent for non-game apps. Before you start running ads, make sure you’ve optimized your screenshots. Since there is no other way you can A/B test your screens, Creative Sets allow you to do just so. Typically, your campaign picks up the first three screens from your app store description, no matter whether it works for you or not. There may be cases where your campaign only displays your app icon and other cases where it displays both icons and your screenshots. Anyway, according to Apple, they know better which format is best for that particular search and display the highest converting format. On the bright side, you can change it now. Now it’s all up to you what screens or combination of screens to upload for your ad. You can make a creative set at the ad set level and perform A/B testing to check which combination works for you better. Once you know the result, you know what to do with your next app update. 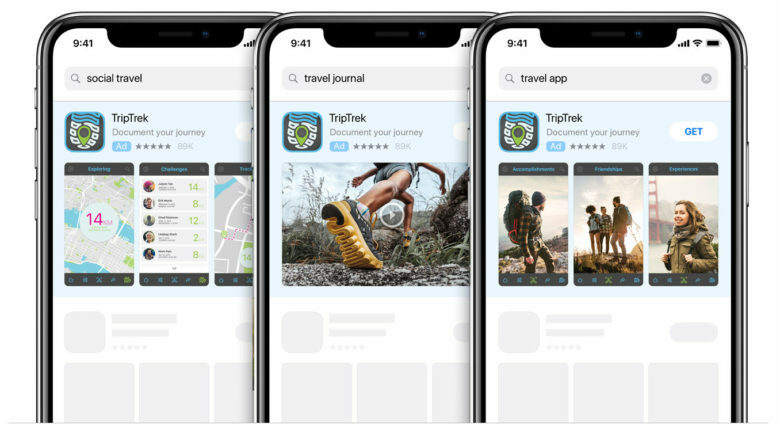 With 65 percent of downloads that come directly from App Store search, according to Apple, it’s critical for developers and marketers to keep certain best practices in mind when running ad campaigns. It helps them become more relevant for targeted keywords and niche audiences. By monitoring and making adjustments, chances are that they can convert more users and see long-term results. Otherwise, it will result in a poor conversion rate. So, what are those best practices helping to propel business growth? When it comes to screenshots, it’s important to enhance them with callout text. By using CTA, you can provide a boost to conversions. Indeed, highlighting high-volume keywords means that users will see it offers exactly what they are searching for. Besides, display concept or character art tied to the latest app updates makes sense. Making a preview video may be challenging but it can increase install rates by more than 23 percent, as StoreMaven reports. When aligning preview videos, consider using a good poster frame which has a big impact as to whether your visitors would watch your video. 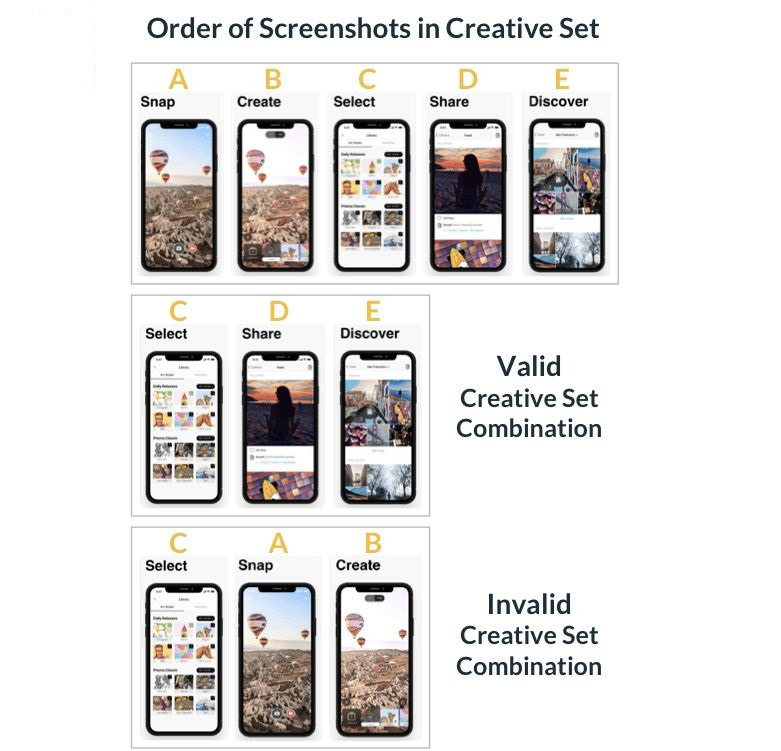 Consisting of screenshots and app previews chosen from your app’s product page in the Store, Creative Sets have their own limitations indeed. No wonders, like most good things, even this great new tool isn’t lacking problems. #1. 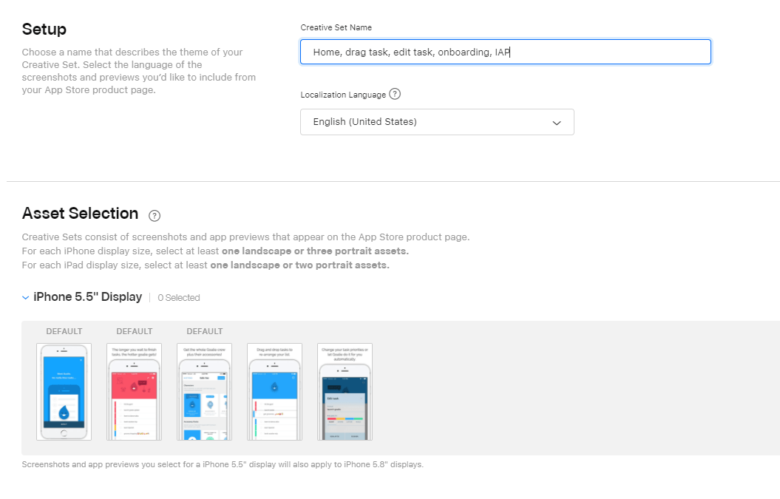 As it was mentioned earlier, you can use screenshots uploaded to your App Store product page only. Every time you want to refresh creative materials and ads, push a new app update. #2. Depending on the way the images were originally uploaded to the product page, you can mix and match them in any way best suited for you. Test different ad combinations from left to right. Learn which are working best. Let’s imagine you have four images – A, B, C, D. Now, attention: four possible combinations will be as follows: ABC, ACD, ABD, BCD. Please note: CBA is an invalid combination. #3. You cannot pause the default ads as Creative Sets will always run against the default image and text ads that are automatically created by Apple Search Ads. #4. The reporting feature is one of the biggest difficulty when working with Creative Sets. You are not able to see a combination of creative and relevant keywords together, demographic data or video performance. 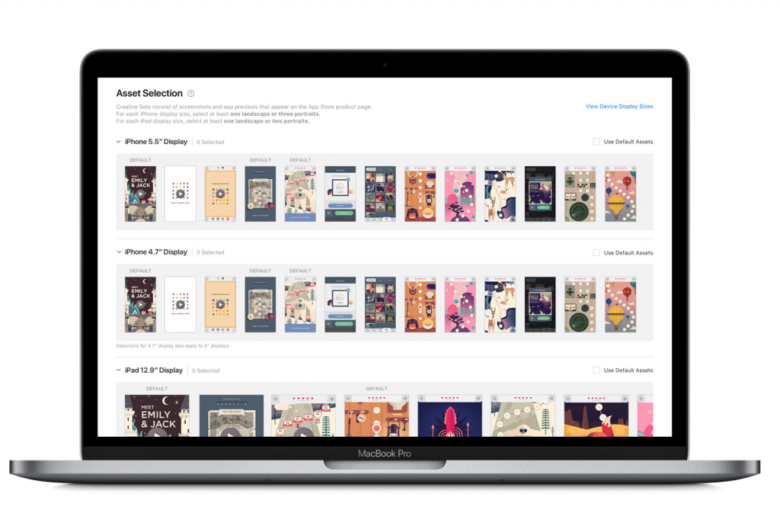 Once you go through Apple’s approval process, you can start using any of Creative Sets in your creative assets pool. Thus, you have up to 3 App Preview videos and up to 10 screenshots to choose from. For iPhone you can select either 1 landscape App Preview or screenshot; 1 portrait App Preview and 2 portrait screenshots; 3 portrait screenshots. 2 portrait App Previews and 1 portrait screenshot. Once you have created an Advanced Search Ads account, select the ad group you’d like to set up a Creative Set. Finally, give your Creative Set a name and select image assets depending on your device targeting. Save the Creative Set, new Creative Sets will show in the list above the default sets. After setting up your different Creative Sets, you’ll be able to measure in the creative sets how your different your different Creative Sets are performing. That’s all you need to get started to improve your App Store discoverability. The process of testing your Apple Search Optimization is as valuable as the result. So, consider several things to do. Take advantage of testing geographic targeting if you have ad groups that target specific GEO’s. Don’t shy away from testing images of those locations to make it more relevant for searchers in those areas. Product offerings come in handy when your app offers multiple services or products. Thus, aligning screenshots of these promotions to relevant keywords is key. Ability to use video and landscape assets can help set you apart from the pack. Known for simplicity and elegance, Apple offers you to seize the opportunity to expand your app’s reach. Thus, with a few simple tricks up your sleeve, Apple Search Ads Creative Sets make it easier to achieve your target cost per action, spend less and convert more. So, go ahead and make a difference between a hit app and a major miss. Knowledge is your best tool in helping your app stand out against the crowd. The Profitner network is pleased to share useful details and facts to help you succeed. Share your comments, thought and ideas below!